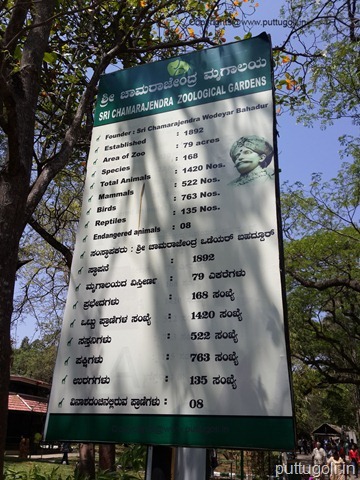 I had visited Mysore zoo for about 10 years back and remembered spending most of the day there seeing variety of animals. So, I knew very well that if we visit the zoo then at least half day has to be spent there though it is worth. Yesterday (March 05, 2016), my family and me visited the zoo. My son enjoyed seeing all the different animals, birds and snakes. On the way back to Bangalore he was talking about them a lot. While planning for this trip we had a question whether to walk or to use the electrical vehicles. As per one of my wife’s friend it was decided to use the electrical vehicle available there but fortunately (!) we did not get opportunity to board one of them. As the authorities said, it will be available after 2:30 PM (we reached the venue by 12:45 PM), the idea was dropped. As we walked around and started seeing the birds (they are kept at the entrance), then we thought if we were on the vehicles then would not have got chance to see them from nearby. We did not take any professional cameras and took photographs by our mobile phones. Though it is not a wise idea to take photographs with mobile phones we did not have choice!!. They were collecting 10 Rs for each of the water bottles we carried and sticking a label on each of them. Money is paid back at the end of the visit at the gate. 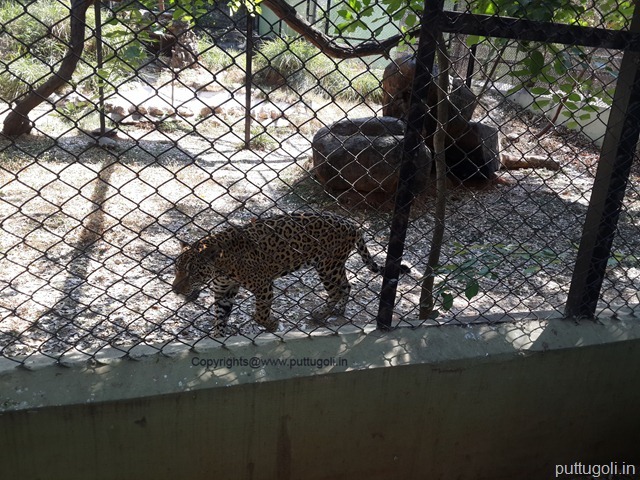 This was done in order to make sure that visitors do not throw the plastic inside the zoological garden. Nice idea!!! 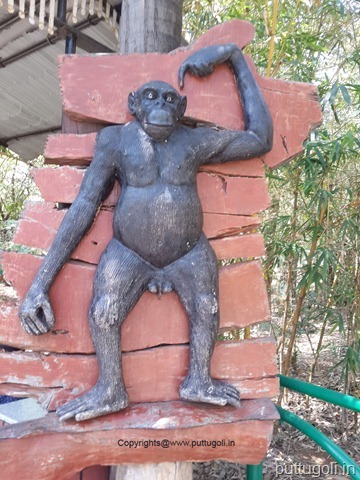 There are some Chimpanzees at the zoo. We can find a board outside explaining the human evolution too. Though these creatures are the attraction of the zoo and look funny for the visitors, it is very sad that they have to be there in the same place throughout their lifetime. Human population is growing with increasing number of metro cities. 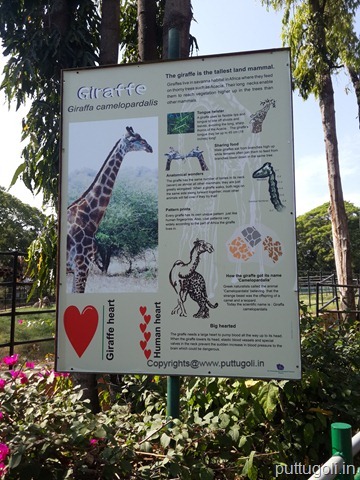 For the upcoming generations Zoological gardens, Wildlife sanctuaries and national parks might be the source to see animals. We went on seeing the birds first, then Lion, and then other animals. 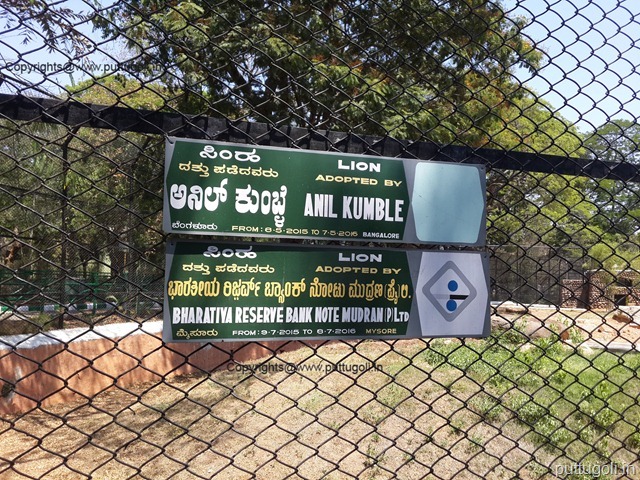 Appropriate sign boards were kept at all stages and hence it was easy for us. Zoo covers 157 acres of land and comprises of 1320 animals. It takes for about four hours to see all the animals. We were almost exhausted by the time we reached exit. The zoo has introduced adopt-an-animal scheme. To adopt an animal for one year Rate card ranges from 1000 INR to 1,75,000 INR. We can sit at home and select the animals online and pay for it. Income tax exemption is also available under 80G of the IT act 1961. 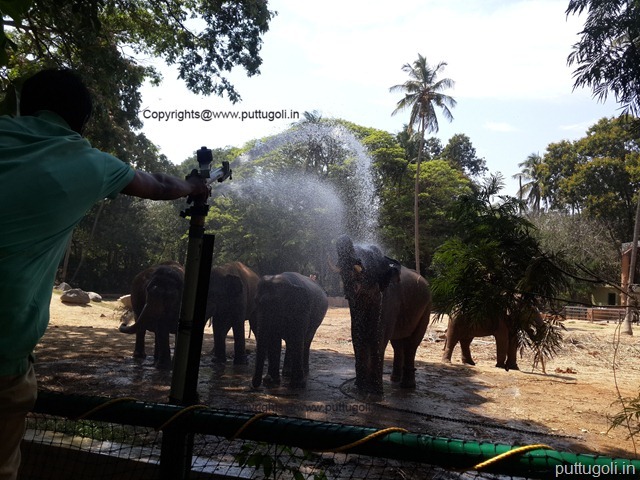 There were eight elephants; five out of them were at the sprinkler raising their trunk towards the water. I was wondering if the African and Indian elephants are kept together how would they communicate? They might start fighting and that might be the reason why they are kept apart. African elephants were having bigger trunk and tusk compared to their Indian counterparts. 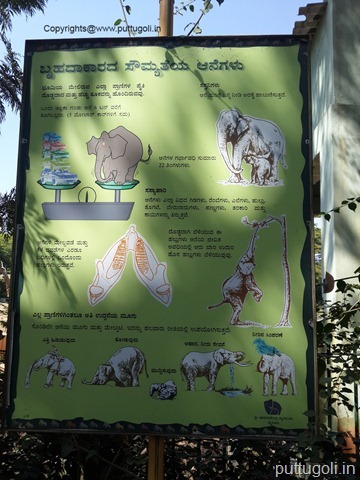 We saw the information board about the elephants conveying the size of an elephant. It says a male elephant can weigh up to 6 tons. Now, think of seeing a herd of elephants in the forest. It’s so scary!! am I right? Elephants are very particular about protecting the little ones’ by keeping them in between the group and save them from any predators. 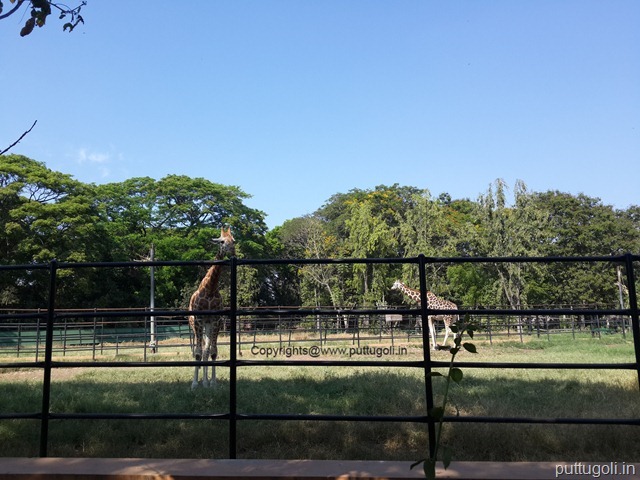 At the end of the visit, we were seeing Giraffe. They were standing so still that looking like a painting. For them the food was kept at their height on some trees. Their size was around 8 – 12 feet. They weigh for about 800 KG and eat 30-35 KG of food a day. 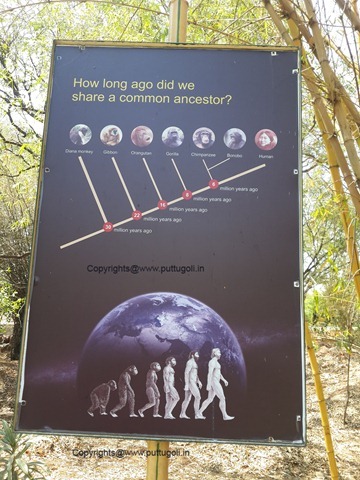 It was a nice trip to Mysore zoo. Photos I have taken are from my Samsung Galaxy S4 and next time if I visit, will definitely take a good camera with me. 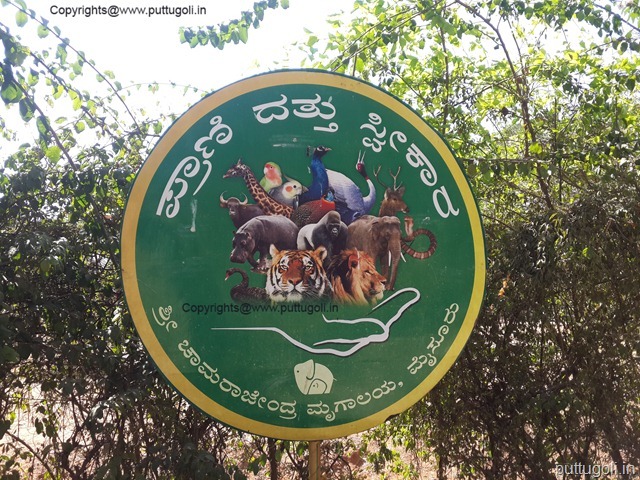 Reach Mysore by either train, bus or any private vehicle and ask for the Zoo in the city. Since it is a famous tourist place, will not be difficult to find out the place. From Monday to Sunday – 8:30 AM to 5:30 PM. Tuesday is Holiday.